AFH:DFW, the local chapter of Architecture for Humanity, is hosting a fundraising event for water, sanitation, and education improvements in five villages in Nepal on Saturday, September 10, 2011 at the Indreni Nepali Cultural Center in Irving. The event will have dancers, a silent auction, music, snacks, a debut of the documentary “The Mountain Between Us” about two girls living in Nepal. 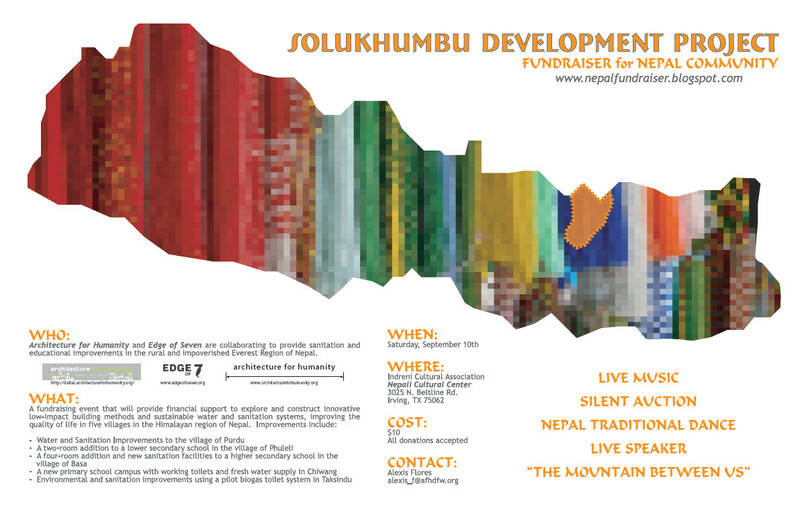 Tickets for the event are currently on sale at nepalfundraiser.eventbrite.com. Join as us we celebrate the culture of Nepal through traditional dance, music, silent auction of photographs and paintings, and the debut of the documentary “The Mountain Between Us”. Your donation, participation, and support will help provide the funding needed to initiate these improvements, and ulitmately pave the way for a sustainable future for Nepal. Cost – Suggested donation of $10, but feel free to donate more! For more information, visit nepalfundraiser.blogspot.com.